Overview of the steps and costs involved in a fully designed and built Nelson treehouse. Below are the broad steps of our full-scale design and build process, as well as an overview of our pricing. It all begins with you submitting an inquiry via our online questionnaire. Your questionnaire informs us about your vision and helps us determine if Nelson Treehouse would be the best fit for your project. We review each inquiry thoroughly, so kindly ask for your patience while you await a response. If your project resonates with Nelson Treehouse, one of our team members will schedule a phone call with you before moving forward to arrange a site visit. Please be aware that due to the high volume of requests, the wait time for our full-scale design and build services may be significant. Hang in there! We care deeply about your timeline and do our best to accommodate it. During our site visit, we get to know you and your vision for your treehouse, discuss your budget, and meet your trees. We gather measurements and information about the selected trees and your property to guide our design process. For our conceptual design package, our designers produce a floor plan, drawings for the platform and elevation, a rough order of magnitude budget, and basic specifications detail. We may also conduct a preliminary investigation of zoning and permitting regulations. This stage may not be necessary, depending on the location and scope of your project. Under an additional design contract, we may conduct a secondary site visit to gather data for digitally modeling your trees, partner with engineers to generate a comprehensive set of architectural drawings, and assist you in obtaining required building permits. Please note: Obtaining a building permit in your jurisdiction may be required. Costs associated with this process are similar to typical residential construction. We strongly recommend researching the regulations of local building authorities regarding treehouses. Please review the section in our FAQ on permitting for more information. We oversee your build from prefabrication in our Washington State-based shop, to shipment of prefabricated components, to onsite completion. Our carpenters excel at their craft, building artful and durable treehouses. We pride ourselves on leading a joyful, safe, and seamless build experience, believing that the process of building your treehouse is as fundamental to its magic as being in the completed structure. Our crew uses only the highest-quality hardware and tried-and-tested techniques that foster the longevity of both trees and treehouse. As necessary, we hire subcontractors for additional services including insulation, roofing, plumbing, and electrical. We base the construction portion of our services on a fixed-bid contract to control costs. Please note: We do not manage any interior design services (apart from custom built-in furniture, as specified in our fixed bid), road construction, or installation of utilities on your property. If utilities are part of your vision for your treehouse, all necessary infrastructure (e.g., septic system, water service, electrical service) must be present and accessible onsite of the treehouse prior to construction. Once utilities infrastructure is established onsite of the treehouse, we will oversee the installation of these amenities within the structure. STEP 6. ENJOY THE TREEHOUSE LIFE! Costs vary widely depending on the location and scope of your treehouse. Our current baseline price of fully designing and building a custom treehouse is approximately $300,000. The design portion of our services constitutes about seven to ten percent of that total price. The minimum cost of our design services for a fully permitted and engineered treehouse is approximately $20,000. Our typical treehouses range from 200 to 500 square feet and can include most amenities of a typical "ground" house. At each step of the process, we provide you with a custom quote outlining our scope of services, hourly rates, and any estimated travel fees. 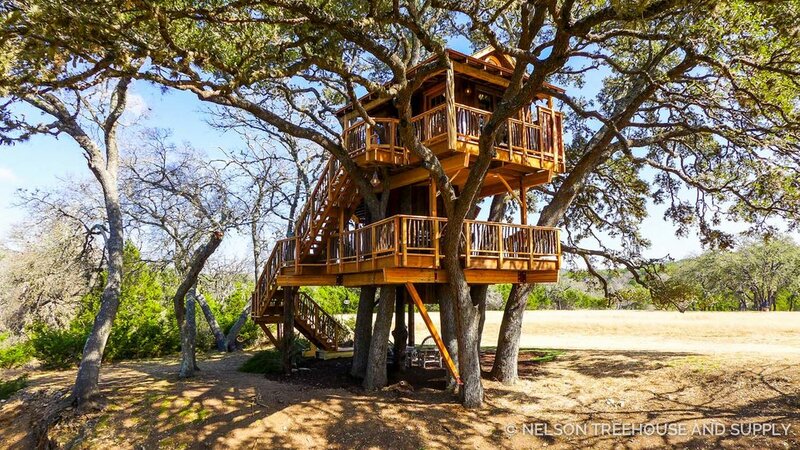 In other words, the total price of your fully designed-and-built Nelson treehouse is equal to our design services costs plus the cost of our fixed-bid construction contract. Logistical costs (e.g., crew accommodations, plane tickets, car rentals). The following chart displays the approximate proportions of elements that comprise the total cost of building a treehouse. Please note that these proportions and costs are subject to change depending on the location and scope of your treehouse. All elements are subject to applicable taxes. Our designs services are typically paired with our build services, but can also be contracted independently. Our range of services can be customized to fit your goals and budget. If a fully designed-and-built treehouse is out of your budget, please don't despair - we have other avenues available for you. We offer consultations, heavy-duty hardware, plans, and other supplies to support you in building your own treehouse. You might consider contracting our design services and/or purchasing our plans, and then hiring a local contractor to build the treehouse. We've supported many clients in building their dream treehouses without making use of our full-scale design and build service. We've refined an efficient science of prefabricating, shipping, and building treehouses onsite - nonetheless, transporting and temporarily housing our crew for the duration of your build are significant logistical costs. Treehouses within a one-hour drive from our location in Fall City may not be subject to the logistical costs of crew accommodations associated with long-distance builds. If you would like utilities such as water and electricity in your treehouse, it is your responsibility to permit and install the necessary infrastructure (e.g., septic system, water service, electrical service) at the location of the treehouse before construction begins. These costs are above and beyond the costs of our design and build services. Once utilities infrastructure is established onsite of the treehouse, we will oversee the installation of these amenities within the structure. As adding plumbing to a treehouse can be considerable expense, we encourage you to consider more economical and environmentally friendly options like compostable toilets and grey water sinks. Obtaining a building permit in your jurisdiction may be required. Costs associated with this process are similar to typical residential construction. We strongly recommend researching the regulations of local building authorities regarding treehouses, as it varies from place to place. Please review our FAQ section on permitting for more information. 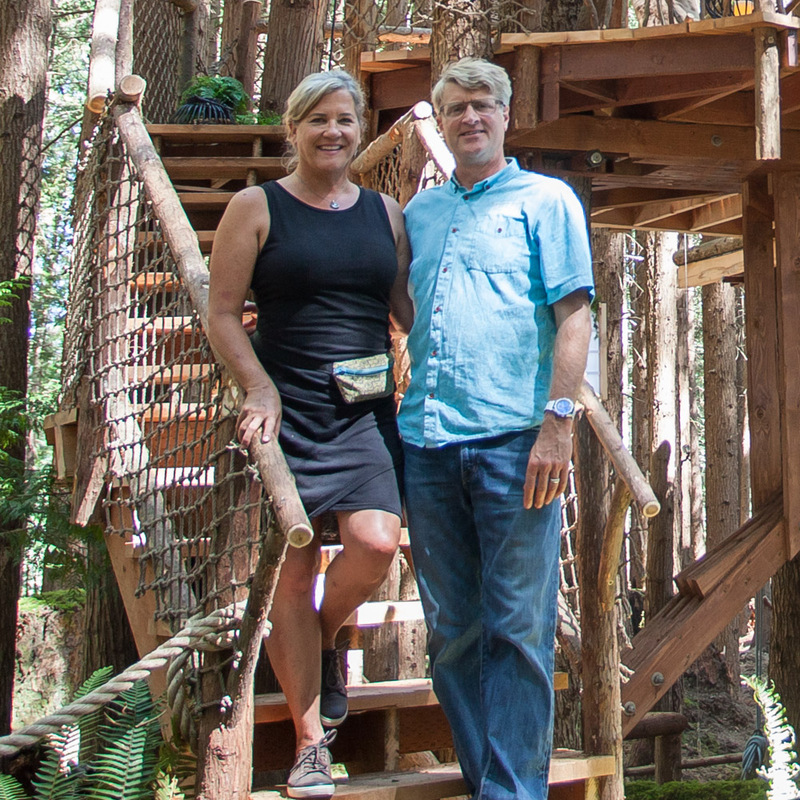 One final note: Although we have the honor of building treehouses around the world, we remain a small, family-owned business rooted in the rural town of Fall City, Washington. We build beautiful treehouses for incredible people - but not overnight, and not without being steeped in the context of our dusty, dog-friendly, dynamic workspace. To put it another way: we may be on TV, but turkeys (real, live turkeys) still wander into our office on a daily basis. If you have reviewed the information on our website, we invite you to submit an inquiry by clicking here so we can learn about your vision and determine if Nelson Treehouse would be a good fit for your project. We review each inquiry thoroughly, so please be patient while awaiting a response.